We might be living in the first chapter of one of my own detective stories, the kind of story I always felt to be so improbable. A woman lay dead upstairs waiting to be screwed down; in another bedroom a man was having hysterics; in the kitchen a grey parrot was imitating both their voices; and in the sitting-room crouched the pugs, glaring at us now with rage and terror in their popping eyes. Soon a car would drive up and Henry’s sisters would join us, and Mr Galvain the man of business; and I, the stranger, wearing black for a woman I had never known, sat waiting to meet them. 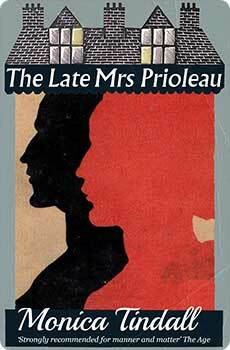 At the opening of Monica Tindall’s brilliant only novel, Susan Prioleau wishes to investigate the source of the darkness and dysfunctionality in her husband’s family. Susan’s background as a mystery writer and journalist makes her the ideal choice to unearth the truth behind Helena Prioleau’s startling transformation from a charming, witty, artistic girl into the abusive woman she became after marriage. Susan’s investigations are as addictive and compelling as a detective novel, and Tindall’s subtle understanding of human nature will leave readers fascinated and conflicted about a woman who suffered much and made others suffer with her. This new edition includes an introduction by Gillian Tindall. “Shows her to have a style that is already mature, as well as considerable descriptive powers. Using the first person narrative technique, she unfolds the tragic story of a late 19th century marriage of convenience.